Hello and welcome! In this interview I am so excited to be interviewing the amazing Natalie Walstein of Soulshine Astrology. We’re talking all about Natalie’s journey, and how you can use Astrology to find your soul’s calling, just like she did. Ashley: Natalie, thank you so much for being here with me. Natalie Walstein: Thank you so much for having me. Ashley: I’ve been following you for quite a while now, and I just love everything you’re doing. For those who may not be familiar with your work, would you mind telling our listeners a little bit about yourself and how you got started working in Astrology? Natalie: I’m a Career Astrologer at Soulshine Astrology. Basically, what I do is combine career coaching with astrological wisdom, which I get from your Astrology chart. This is basically a map of where the stars were at the exact time, date and location of your birth. I got started with this from looking at my own Astrology chart. At one point I literally had no idea what to do with my career anymore. I just didn’t know what to do. I remembered that Astrology was really cool, because I’ve always been a bit into it. So I decided to look into it again, and this time I dove in really deep. I found it so fascinating and it ended up showing me where I was going wrong in my career, and how to shift into something more suited to me. I realized that I could help other people do the same thing. That’s really where it all started. Ashley: I love that. Really, it was your own love and passion of Astrology that got you here. Turning to Astrology as a tool to help you in your own life is what inspired you to actually pick it up and work with it as a way to inspire others. Natalie: Exactly! That’s why I love it so much. How does Astrology really factor into someone finding and living their life’s purpose? Natalie: Most people usually think of Astrology as just being about horoscopes. I used to think that too, but it turns out there is so much more to it than that. I’m actually sometimes really caught off-guard by how much information you can get about it. It literally explains everything about you. There’s no wonder why I can tell you about your life’s purpose. I really feel that the purpose of Astrology, in my eyes, is to find your life purpose because it really helps you tap into who you really are, what you really want, what makes you happy and also how you can harness all this in the best possible way, and in your own special way. Instead of, for example, just looking around and applying for jobs. It really gives you this feeling of “No! This is what I need.” You can either create it for yourself or you can go out into the world and say no to everything that isn’t in alignment with you, which is so empowering. Ashley: I love that so much. We were actually just doing our little mini-class for our upcoming Crystal Mastery Conference. You’re going to teach people all about looking at Astrology and recommending some crystals that might be really helpful for them while they’re pursuing their life path or their soul path. I was wondering if you would mind just teasing this, maybe using your own Astrology? What some of your favorite crystals to use while pursuing your life path? Could you give us an example? Natalie: Sure. I’m a Pisces. As a Pisces, what I’m inspired to do in the world is to uplift and inspire others to believe in themselves and to open up to more of the magic that this world has to offer. In terms of crystals, I would suggest Amethyst for Pisces. I know this is pretty straightforward because you hear that a lot. The reason why I say that is because Amethyst really helps you to open up to the spiritual realm, and also calm down and settle your mind. It helps open you up to the magic that the world has to offer. As a Pisces, I can give that to other people, because that’s really what I get fired up about. Another one for Pisces would be Aquamarine. This helps to release built-up emotional baggage that might be holding you back from believing in yourself. It encourages you to get out of stuck-ness or stagnation. This is true for everyone. You don’t need to be a Pisces, but it’s especially good for Pisces because if Pisces are there to help other people believe in themselves, then they need to believe in themselves first. Ashley: Like you said, this is just one really small little piece of the whole puzzle. There’s so much more to Astrology than this, of course. When it comes to looking at working with some stones or connecting with some stones to help you a little bit on your soul path, these are just a few examples. In your little mini-class for the Crystal Mastery Conference that we have coming up, you talk about crystals for all 12 signs. Is there anything else that you want to tease or let people know about your mini-class that you’ll be sharing at the conference? Natalie: I really try to use crystals for each of the signs that would both help you tap into what you’re really meant to do, and also ones that will help you overcome anything that’s negative and keeping you from pursuing your purpose. Ashley: That’s a really good way to describe it. That’s probably some of the most valuable information I’ve heard about crystals and Astrology in a while. In this mini-class, you give not only the crystals that are most likely to help us tap into our own strengths, but also to overcome when we get in our own way. I’m really happy that you are able to share that with us in the mini-class. If you want to hear more from Natalie, I definitely encourage you to sign up for that class. Natalie, can you tell everyone just a little bit more about the work that you do and where they can stay connected with you online to learn even more? Natalie: I’m on Instagram all the time, @soulshineastrology, with daily updates about what’s going on in Astrology and always trying to empower you to live your life calling. I’m also at soulshineastrology.com where I offer career Alchemy sessions, which are one-part career coaching and one-part Astrology reading – to really help you get where you want to be using your Astrology chart. I also have Cosmic Career Blueprints, which are reports all about your birth chart. There are so many more resources and other things too. Go check it out if you’re interested. Ashley: While you’re at Natalie’s website, be sure to sign up for her e-mail as well, because she sends absolutely fantastic e-mails out. Natalie, thank you so much for being here with us today! I really appreciate it. Natalie: Thank you so much, Ashley. Did you enjoy this interview with Natalie Walstein? Don’t miss out on our Crystal Mastery Conference! Sign up HERE. 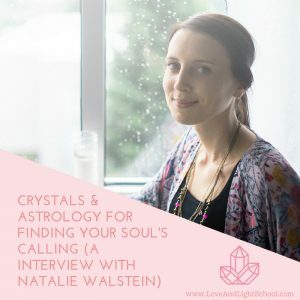 In this interview with Natalie Walstein of Soulshine Astrology we discuss Natalie's journey, and how you can use Astrology to find your soul's calling.